I'm not going to write about politics, although my heart is heavy. Instead, I'm going to tell you about the day I spent with my mom, Sunday, November 6, making pumpkin preserves. It was a really nice day. Early Sunday morning, I drove my friend Jana to the airport. She'd been in town for her sister-in-law's bridal shower, which we attended the day before. I've been close with Jana's in-laws since we stayed in their family home in Guadalajara fifteen years ago. I remember that trip so fondly: we met many aunts, uncles, and cousins, I tested out my mediocre Spanish, I had my first chilaquiles, michelada, and coctel de camarón, and on New Years Eve, we ate 12 grapes at midnight Jana's husband's uncle's stately home. So it was fun to see everyone at the shower again, celebrating with the family over mimosas and tacos on hand made tortillas. I took Jana for coffee at Porto's before dropping her off. The bakery started out in the 70s with the family matriarch, a new immigrant from Cuba, baking cakes in their tiny apartment, and is now one of Los Angeles' most successful local chains. I will take any opportunity to scarf down one of their amazing potato balls – filled with seasoned ground beef and fried until golden – or a perfect guava cheese pastries. Making pumpkin preserves requires soaking the cubed pumpkin in a solution of pickling lime for hours: this dunk ensures that your finished product will stay crunchy on the outside, so that when you bite into it you get a juicy burst of fragrant cardamom and rosewater syrup. My mom came to my house Sunday morning, and once we scooped out the seeds, sliced, peeled, and diced the giant pumpkins, I dragged her along for my day's activities. We walked to the Atwater Farmers Market. Mom wasn't hungry, so I reluctantly walked us past the new booth where friendly Jamaican ladies sell delicious "patties" — warm pastry pockets stuffed with spiced meat or vegetables. I explained to my mom what pupusas were as we passed Delmy's stand. She and her pupusas have been a fixture in our east side community for years. She even served them up, fresh, hot, and topped with tangy curtido, at the wedding of my friends Talia and Daniela in Elysian Park two years ago. 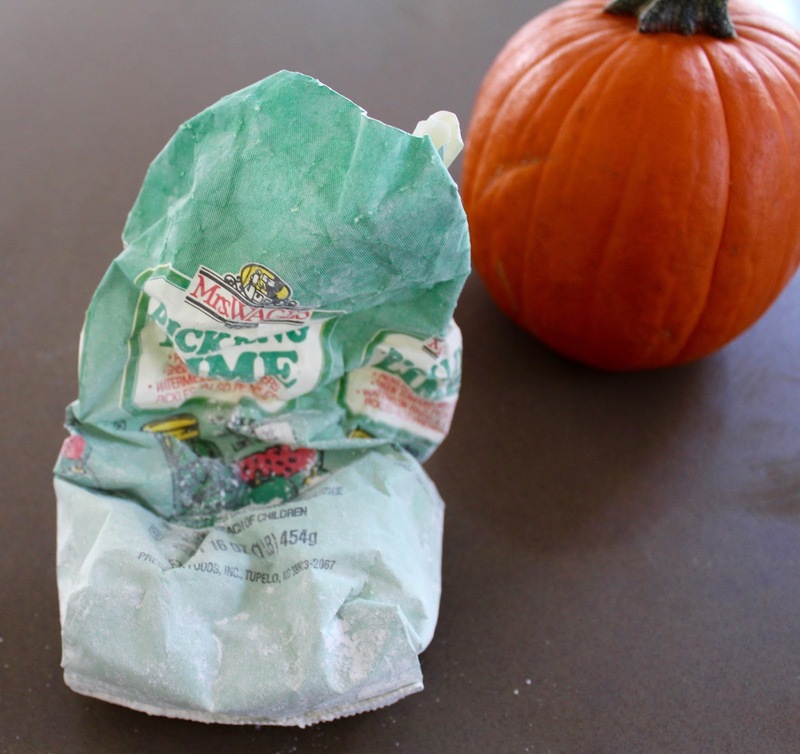 We walked home and checked on the pumpkin, and could already tell that it had crisped up in the lime solution. Then I took my mom to the birthday party of Leo, the four-year-old son of two close friends. As we walked up to their picnic tables in the park, two-year-old Tashi ran up to me in two different shoes — her favorite new fashion statement. I was the maid of honor at Tashi's parents' wedding. I have her mom, Jessica, to thank for introducing me to the simple joy of sticky rice with toasted seaweed and kimchi back when we were roommates in college. I have her to thank for a lot. We had tamales and birthday cake (chocolate with chocolate frosting – birthday boy's choice), and as we left, 3-year-old Azalea told me that she was an astronaut. Keep dreaming big, little AZ. We came home and got back to work. This recipe comes from my Auntie Mohtaram, my mom's eldest sister, and my mom called her a couple times as we prepared the pumpkin to make sure we were doing everything right. Mohtaram really is a window into another era, in another world, to me. She grew up in the Jewish ghetto in Tehran and was married off early as a child bride. She moved in with her husband's family in Khorramshahr, near the Iraqi border, and this recipe might have Iraqi origins (or maybe Armenian). Now, at 87 years old, she has 8 grandkids. Her youngest great-grandchild, Kiran, is also my littlest cousin. His mom, a psychiatrist at MIT, adopted him three years ago. He has the smiliest eyes and a silly sense of humor. 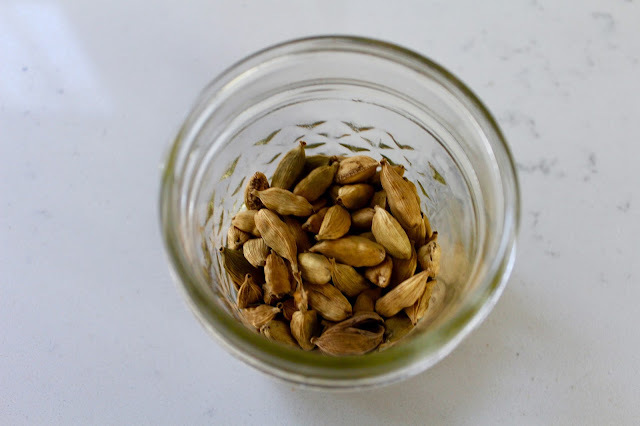 Cooking cross-generational recipes always gets the memories flowing, and even though this is a recipe Auntie Mohtaram brought to the family, I couldn't help but thinking of Mamanini, as we called my maternal grandmother. She was a tiny old woman, round and cozy, with the softest skin. Always in a dress, often with a beautiful scarf in beiges, blues, and greys tied over her hair. She was one of the most openminded and quickest to laugh in our family, and always the one bringing all the family together in her home after toiling in the kitchen to feed us. Mamanini was married as a young teen, and started having babies shortly thereafter. She never went to college, and yet spoke English, some Hebrew, some French, and some Arabic. She was a talented artisan, knitting intricate Persian rugs, and eventually had a staff of knitters in her home, creating rugs that her husband would sell at the bazaar in Tehran. A true entrepreneur. My Mamanini came to the US a widow, and housed my mom, my sister, and me in her home for our first two years in this country after we fled the revolution in Iran. Today, her six children, 18 grandchildren, 39 great-grandchildren, and 5 great-great-grandchildren (!) are all here in the states, and miraculously, we're all still close. That's where we came from, and this is where we are. That was my Sunday, and these — all of these — are my people. 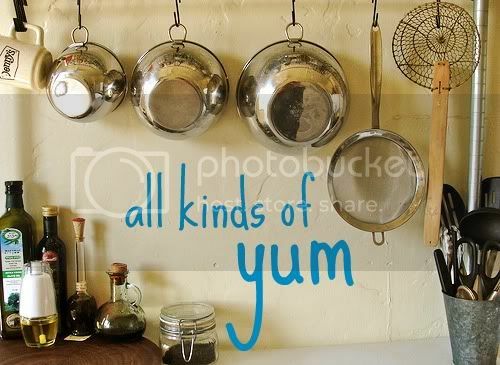 It's a little hard to categorize this dish. Like so many Persian sweets, this pumpkin recipe is flavored with cardamom and rosewater. In my house, we call it moraba, preserves. But it's not spreadable like a jam. 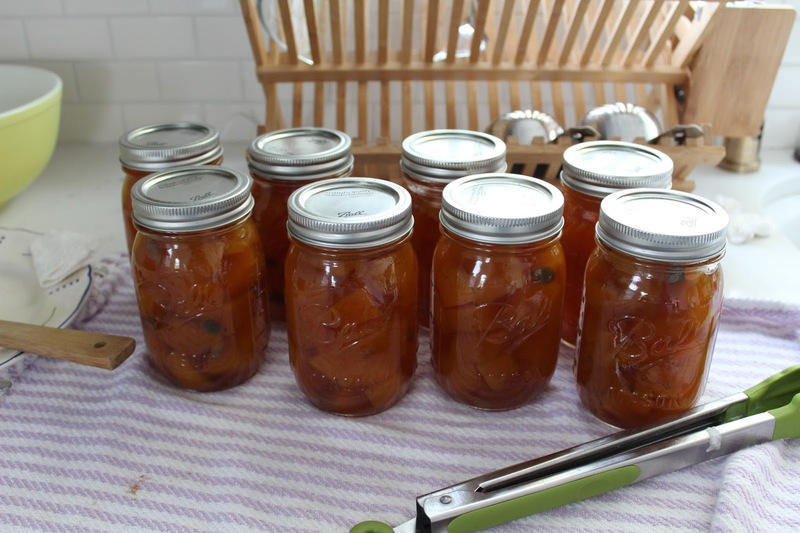 Because of the pickling lime, the cubes of pumpkin develop a crunchy outer wall, but when you bite into them, they burst with sweet fragrant syrup, so it's almost like a candy. But it makes a delicious breakfast with warm flatbread and clotted cream, and it's also beautiful on a cheese plate or mixed into yogurt, and honestly, a couple cubes are a great snack on their own. It's definitely time-intensive, but it's really special. 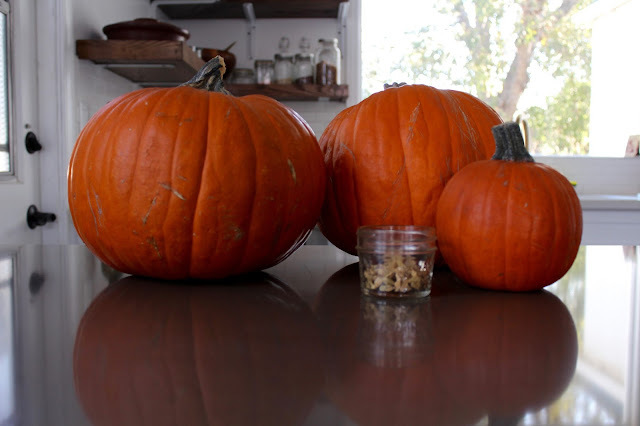 Halve pumpkins with a large, sharp knife, and scrape out seeds and stringy flesh surrounding them. You can save the seeds and toast them. 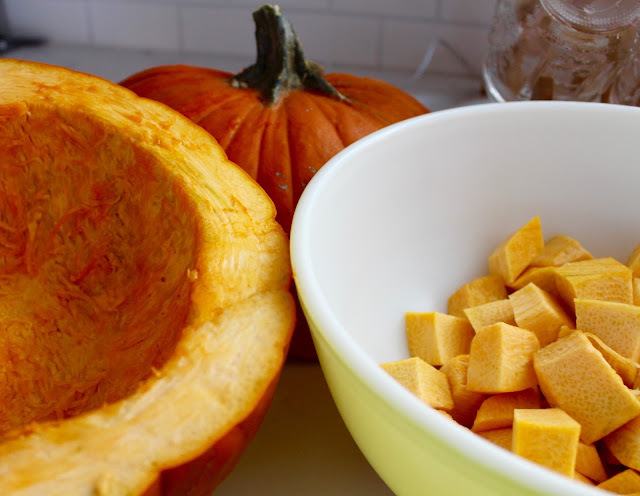 Carefully cut pumpkin into 1-inch slices. 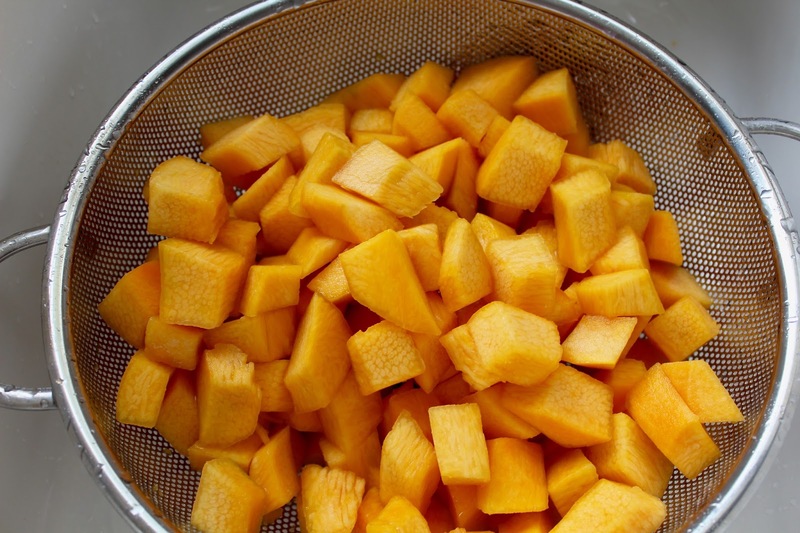 Peel each and cut it into 1-inch squares. 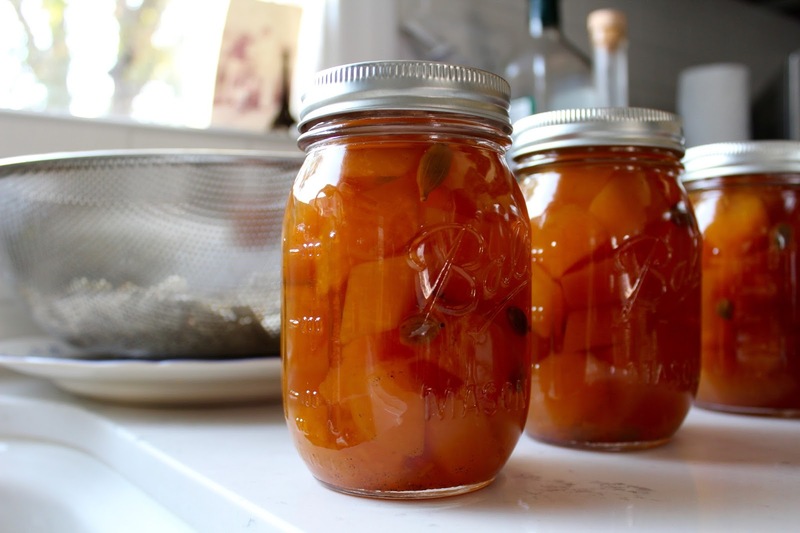 In a large pot, dissolve pickling lime into water. Add pumpkin, then add enough water to cover. Stir, and soak 4 hours or overnight. Rinse pumpkin, under many changes of water, until lime is completely and thoroughly washed off. * Bring water, sugar, and cardamom to boil in a large pot. You're going for a very sweet syrup here. 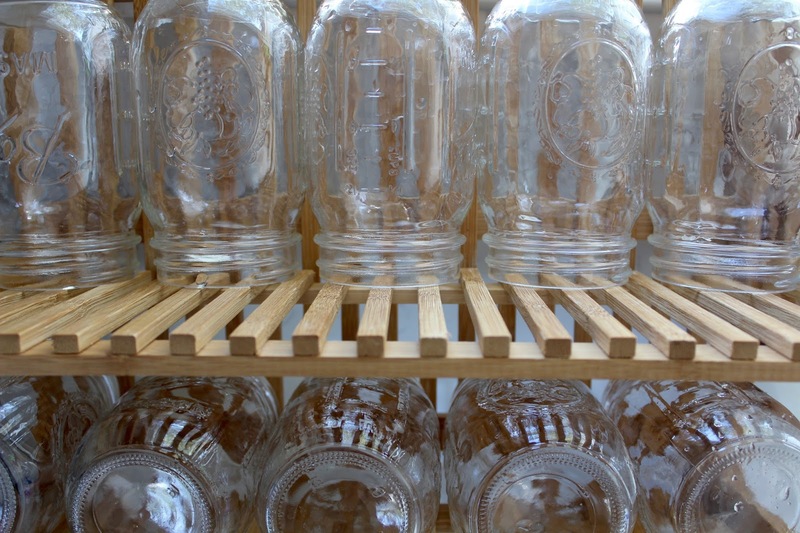 Measure out your water as you fill the pot, and add one cup sugar for each cup of water. 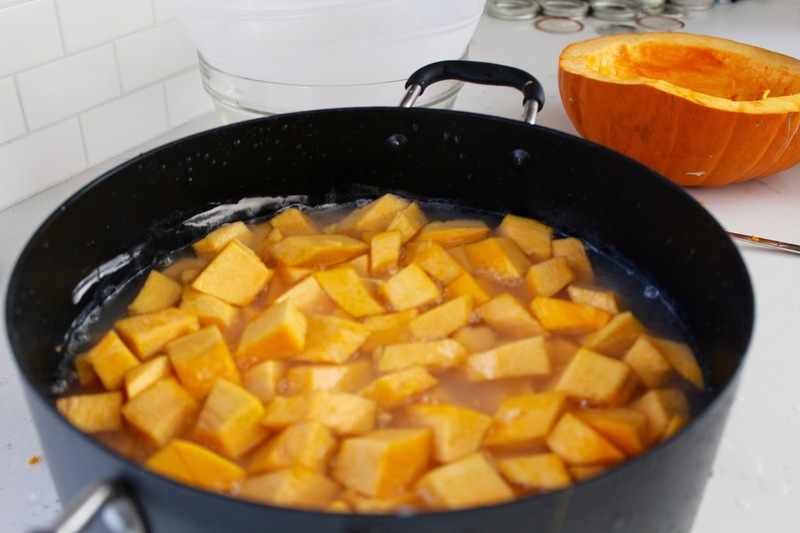 You should have enough syrup to generously cover all your pumpkin (you'll need this to fill your jars), so if, once you've added your pumpkin, you find that you need more water, be sure to add sugar to match it. 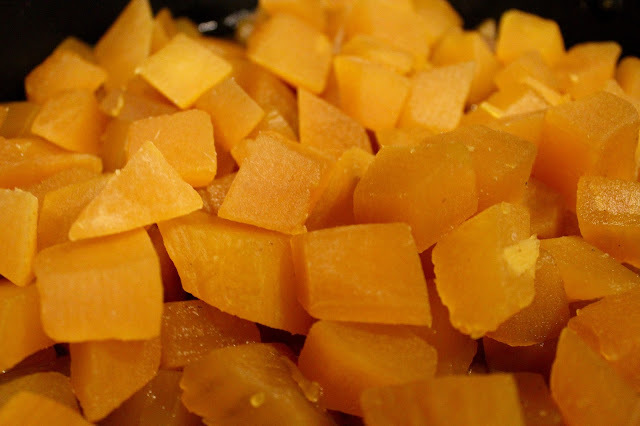 Carefully add pumpkin, bring back up to a boil, then simmer, covered, for about 2 hours. After about twenty minutes, taste a piece. It should be very sweet, and have a strong cardamom scent. Add sugar or cardamom if necessary. After two hours, taste a piece for texture: it should be crunchy on the outside, but soft, juicy, and fully cooked within. Remove from heat, and stir in rosewater. Carefully place in jars, refrigerate for immediate use, or follow proper canning techniques to make this jam shelf-stable. 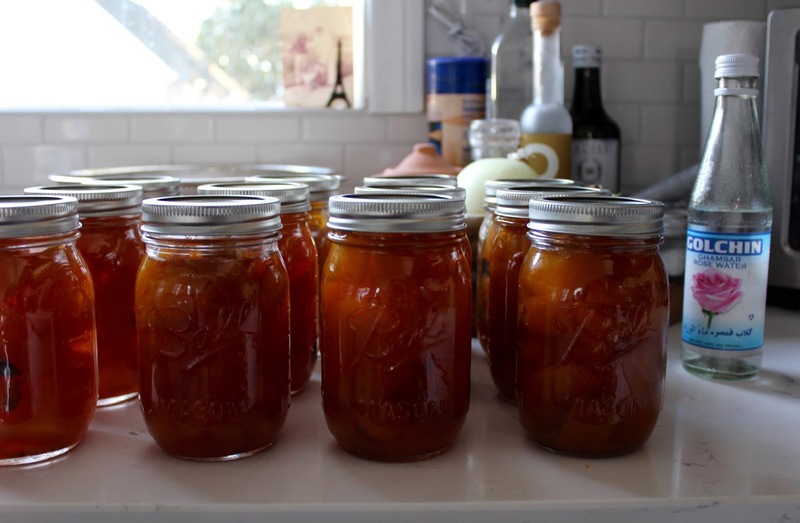 If you are canning, be sure that all pieces of pumpkin are fully covered with syrup. * Read this warning about pickling lime. It's very important to clean it thoroughly from the pumpkin. ** Always buy imported rosewater. The domestic stuff tastes like water. thank you! i miss sabzi! !